The world's most recognizable television minister guides his readers along the path of prayer in his first spiritual autobiography. In a nondenominational book meant for all audiences, Dr. Schuller uses his own life story to how how prayer has been the supreme essence of his spiritual journey, as well as an exciting adventure in knowing God and being His instrument. - Publisher Now in paperback from Robert Schuller! Now in paperback from Robert Schuller! 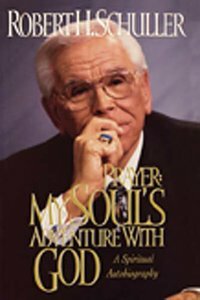 Dr. Robert Schuller, became a minister when he was ordained in 1950. He received his Bachelor of Arts degree form Hope College and a Master of Divinity Degree from Western Theological Seminary, both in Holland, Michigan. From 1950-55, Dr. Schuller was the minister at the Ivanhoe Reformed Church in Chicago. In 1955, Dr. Schuller founded the Reformed Church in America in Garden Grove, CA. with his wife Arvella, the organist. Dr. Schuller has written over thirty books and five of them bestsellers.